Not all medical conditions involving the spine require surgery right away. This is true when it comes to the treatment of spinal stenosis, a condition characterized by the narrowing of the spinal canal compressing the nearby nerve roots, or in some cases the spinal cord itself. 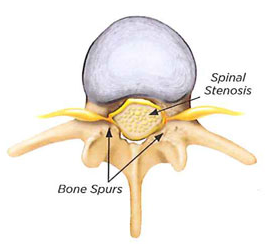 Spinal stenosis is very common in middle to older age individuals dealing with spinal arthritis. It can also occur in individuals who have sustained a work injury and are dealing with flare up of arthritis leading to pinching of nerve roots. This may occur with an Arizona Workers Compensation case or a Federal workers compensation case. Surgery is a last resort option in severe cases when conservative treatment fails. In most cases, stenosis with mild symptoms does not require surgery and the pain can be handled by a Phoenix Workers Compensation pain management doctor. Nonsurgical treatment and management for spinal stenosis centers on 3 main goals. First is to allow normal activity. Second is to relieve mild to moderate symptoms of pain, numbness and weakening of the legs. And third is to help the patient avoid spinal surgery. Acetaminophen and non-steroidal anti-inflammatory drugs are the medicines used to relieve pain and inflammation initially. During periods of significant exacerbations, short term opiates may be extremely helpful. Maintaining a healthy body weight relieves the symptoms as well since excess body fat puts pressure to the spine when in motion. Physical therapy and exercise strengthens and stretches the muscles, which also relaxes the nerves along the spinal column relieving pain and numbness. It also allows the patient to easily move around and improve the quality of life. Aside from the above-mentioned, other conservative forms of managing stenosis are acupuncture and aerobic exercises such as riding a stationary bicycle (which allows patient to lean forward) also helps relieve symptoms. If medicine, weight loss and physical therapy do not relieve symptoms, epidural steroid injection (ESI) is recommended for pain occurring mostly in the legs. Epidural steroid injections have been shown to be over 75% effective for the pain of spinal stenosis and may be repeated every few months. They are outpatient and low risk. With spinal stenosis truly being an elective situation when the decision of whether to undergo surgery is concerned, minimally invasive injections should definitely be tried.